This take on pepper steak with Zio’s Smoky Rub is a simply delicious. It’s great with rice, mashed potatoes and can also be used for making great sandwiches. 1. Sauté onions and garlic in 2 tbsp olive oil. 2. When onions begin to turn translucent, add the seasoned strips of steak. 3. 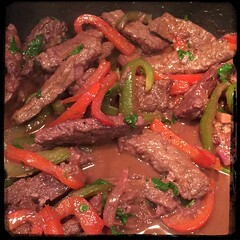 Once the steaks begin to brown add 1 or 2 tbsp of olive oil and the peppers. 4. When the peppers soften add the red wine and let reduce. 5. Mix fresh flat-leaf parsley and serve.